What better activity is there on a cold and windy winter Friday than to daydream about past vacations to warm and sunny destinations? I am longing for sunshine and sand between my toes, thinking of our island-hopping adventures in Hawaii and the fantastic service and turquoise waters at Beaches Resorts Turks and Caicos. And lucky for you, I am also feeling nostalgic and generous! How about a giveaway to celebrate my five-year blogging anniversary and to get our minds on tropical warmth? Thinking back over five years of pondering, writing, and traveling, I have identified one of my favorite items and I would like to give you a chance to win. I was introduced to this item via a fellow blogger and giveaway years ago and I am going to share the same love with one of you. Have you heard of the Trunki? The Trunki is Melissa and Doug's ride-on luggage for little kids. We have had one for several years. Amelia has outgrown the ride-on part, but we just dug it out of the closet to hand down to Andrew. The Trunki ride-on luggage is built out of sturdy plastic and ours looks brand new, even after many travels with a toddler. Even though Andrew cannot ride on it just yet, the small size of the Trunki is convenient for hauling small clothes, toys and books, or various baby items. 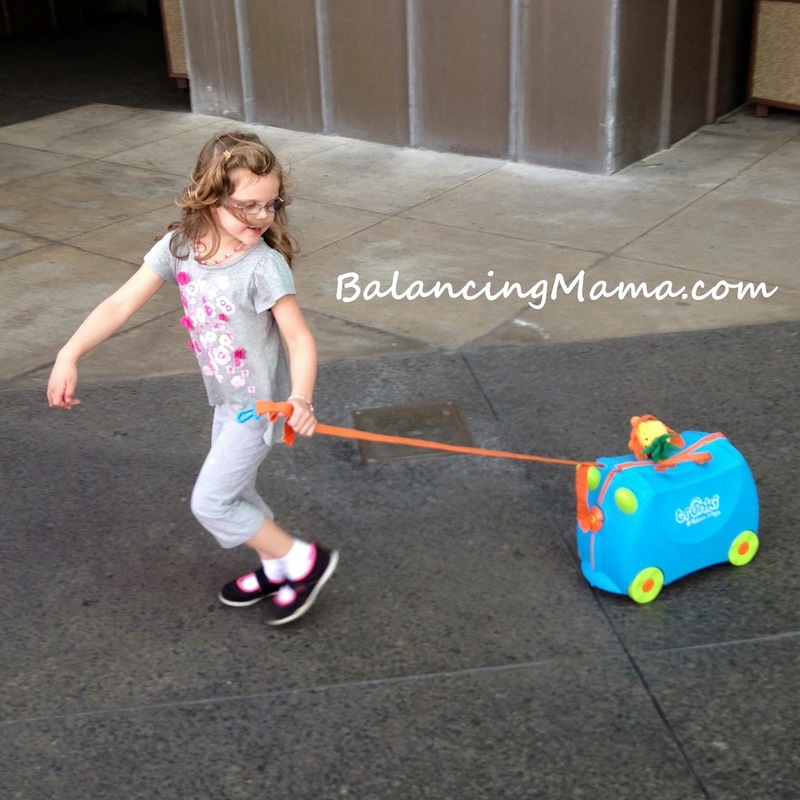 And the wheels and strap make it easy for Amelia to roll through an airport or hotel hallway when we need an extra hand. Plus, it is colorful and cute! 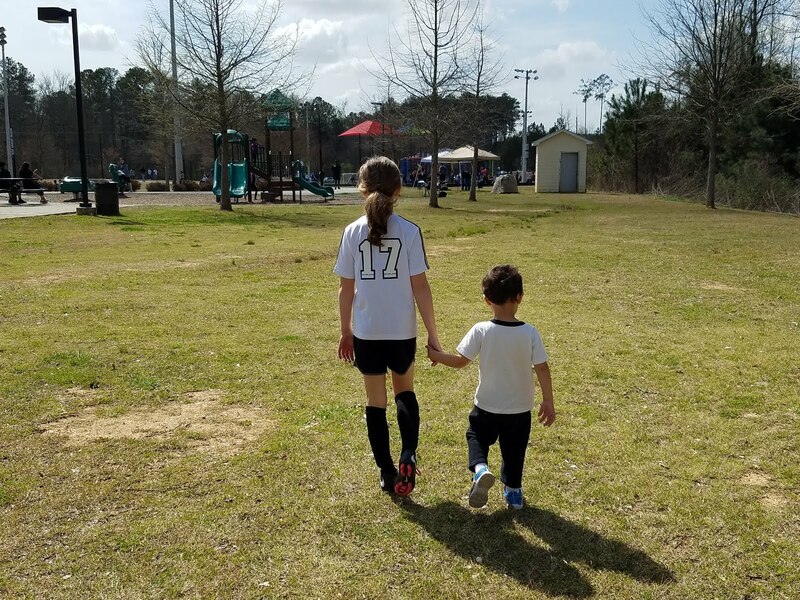 As a frequently traveling family, we know how to pack for travel with kids and we have our own ideas on what works and what doesn't. On a short trip when we don't need a gazillion diapers, we use the Trunki ride-on suitcase for baby items so Andrew's belongings are separate and therefore easy to find when needed. For longer trips, I usually need to fit baby gear and clothes into a larger piece of luggage (I often share my huge one with the kids so we have fewer individual items to carry into a hotel or resort), but we use the Trunki as the special "fun" bag. We use it to haul the books and art supplies and a small stuffed animal or two so when we are in a hotel room or have down time, Amelia knows exactly where to find the entertainment. And because it is carry-on sized, Trunki ride-on luggage is ideal for potential flight delays. 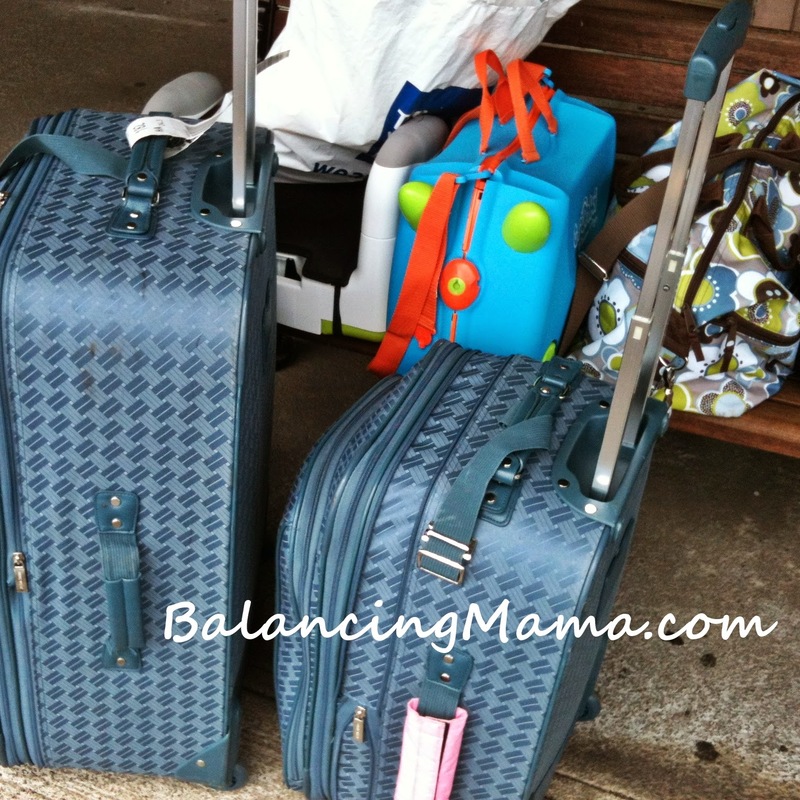 We have learned the hard way not to put the entertainment items in checked luggage! Trunki ride-on luggage comes in various colors with stickers so little travelers can personalize their own adventuring companion. Trunki ride-on luggage for kids is available online via several outlets including Bed, Bath and Beyond, Sears, and Amazon. It retails for around $40. 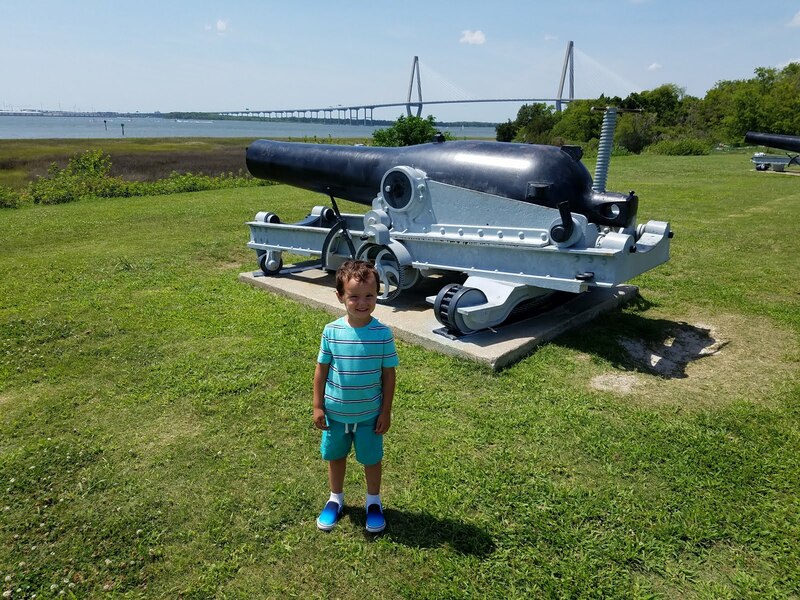 Trunki hanging out with the "big guys"
Celebrate 5 years of blogging with me and enter to win a $40 Amazon gift card so you can bring a Trunki along on your next family excursion. 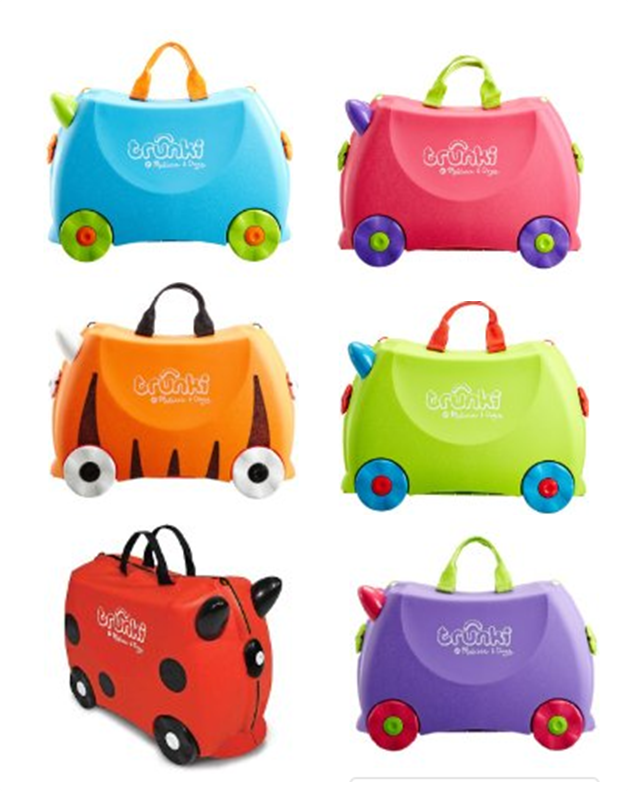 See Amazon's supply of Trunki luggage here. Good luck! Winner will be notified within 24 hours of giveaway close. Amazon.com gift card will be emailed to the email address provided. This post is NOT sponsored. I just like to share my favorite things once in a while!